Our prehistoric Earth, bombarded with asteroids and lightning, rife with bubbling geothermal pools, may not seem hospitable today. But somewhere in the chemical chaos of our early planet, life did form. How? For decades, scientists have attempted to create miniature replicas of infant Earth in the lab. There, they hunt for the primordial ingredients that created the essential building blocks for life. It's attractive to chase our origin story. But this pursuit can bring more than just thrill. Knowledge of how Earth built its first cells could inform our search for extraterrestrial life. If we identify the ingredients and environment required to spark spontaneous life, we could search for similar conditions on planets across our universe. Today, much of the origin-of-life research focuses on one specific building block: RNA. While some scientists believe that life formed from simpler molecules and only later evolved RNA, others look for evidence to prove (or disprove) that RNA formed first. A complex but versatile molecule, RNA stores and transmits genetic information and helps synthesize proteins, making it a capable candidate for the backbone of the first cells. To verify this "RNA World Hypothesis," researchers face two challenges. First, they need to identify which ingredients reacted to create RNA's four nucleotides—adenine, guanine, cytosine, and uracil (A, G, C, and U). And, second, they need to determine how RNA stored and copied genetic information in order to replicate itself. So far, scientists have made significant progress finding precursors to C and U. But A and G remain elusive. Now, in a paper published in PNAS, Jack W. Szostak, Professor of Chemistry and Chemical Biology at Harvard University, along with first-author and graduate student Seohyun (Chris) Kim suggest that RNA could have started with a different set of nucleotide bases. In place of guanine, RNA could have relied on a surrogate—inosine. "Our study suggests that the earliest forms of life (with A, U, C, and I) may have arisen from a different set of nucleobases than those found in modern life (A, U, C, and G)," said Kim. How did he and his team arrive at this conclusion? Lab attempts to craft A and G, purine-based nucleotides, produced too many undesired side products. Recently, however, researchers discovered a way to make versions of adenosine and inosine—8-oxo-adenosine and 8-oxo-inosine—from materials available on primeval Earth. So, Kim and his colleagues set out to investigate whether RNA constructed with these analogs could replicate efficiently. But, the substitutes failed to perform. Like a cake baked with honey instead of sugar, the final product may look and taste similar, but it doesn't function as well. The honey-cake burns and drowns in liquid. The 8-oxo-purine RNA still performs, but it loses both the speed and accuracy needed to copy itself. If it replicates too slowly, it falls apart before completing the process. If it makes too many errors, it cannot serve as a faithful tool for propagation and evolution. Despite their inadequate performance, the 8-oxo-purines brought an unexpected surprise. As part of the test, the team compared 8-oxo-inosine's abilities against a control, inosine. Unlike its 8-oxo counterpart, inosine enabled RNA to replicate with high speed and few errors. It "turns out to exhibit reasonable rates and fidelities in RNA copying reactions," the team concluded. "We propose that inosine could have served as a surrogate for guanosine in the early emergence of life." Szostak and Kim's discovery could help substantiate the RNA world hypothesis. In time, their work might confirm RNA's primary role in our origin story. 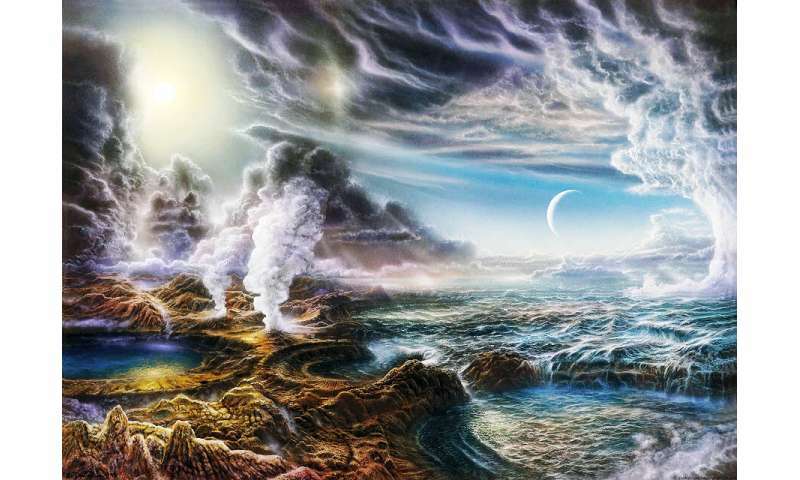 Or, scientists might find that early Earth offered multiple paths for life to grow. Eventually, armed with this knowledge, scientists could identify other planets that have the essential ingredients and determine whether we share this universe or are, indeed, alone. From chemical reaction to living cells – what kicked off the development of early life on earth? For decades, scientists have attempted to create miniature replicas of infant Earth in the lab. There, they hunt for the primordial ingredients that created the essential building blocks for life. Miniature replicas in the lab is woefully lacking in more than just the right primordial chemical ingredients. Scientists may believe that they can throw a bunch of chemicals together with some water, give it some heat, light, maybe a thunderbolt or two - and voila! a unicelled microbe is created. It is far more complicated than that. If we identify the ingredients and environment required to spark spontaneous life, we could search for similar conditions on planets across our universe. In order for a cell to have formed either DNA or RNA initially, the cell would have had to be programmed/had a blueprint for the chemicals to have precisely assimilated to form the cell under perfect conditions. And after its formation, then it would require the Energy from an energy source such as lightning or the Energy emanating from the Creator to give Life itself to the cell. Life doesn't come into being by chemicals and Energy alone. There has to be Motivation to create Life also as it is so easily snuffed out. What creator? You mean the flying spaghetti monster? Spaghetti wasn't invented back then. Well, yes, the purines (adenine and guanine) is synthesized from inosine in the modern cellular metabolic pathway [ https://en.wikipe...tabolism ]. But the biochemistry line of inquiry into emergence of life is inherently problematic; the biology line has a solution since 2016. Life evolved in alkaline hydrothermal vents. For example of possible chemical pathways there, they could synthesize the nucleobases out of amino acids and pentoses out of their own production of simple 3C hydrocarbons and both concentrate and replicate RNA in vent pores. So we have both "necessary and sufficient" pathways, it is the reigning theory. Planets and life are *known* to be the result of processes, and if it looks 'created' to you it is apparent. We do not need to recreate a sun in the lab to know how they form; same with half alive ancestors (but FWIW we have analogs). Scientists may believe that they can throw a bunch of chemicals together with some water, give it some heat, light, maybe a thunderbolt or two - and voila! a unicelled microbe is created. It is far more complicated than that. What flying spaghetti monster? Is that something that you have nightmares about? The Creator is not a monster and has nothing to do with spaghetti. Apparently you were taught, as a child, that your birthright stems only from your monkey roots and assorted chemicals and that that is your true origins and nothing better than the tree climbers that now walk on two legs. You can always go back to living in a tree and picking and eating lice from your fellow monkeys. It can never be reproduced either in a lab or in the ocean. A one-time creation that will not happen again on THIS planet. But it has happened on many other planets that you don't know of yet.